Made from white polyethylene material, these wavers come packaged as singles or pairs. A straw is included for easy inflation. Turn any these products into shakers! 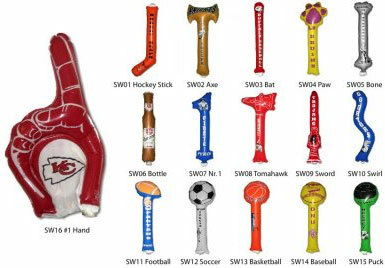 For just $0.08/set, beads will come prepackaged into the Sport Wavers, allowing them to make noise by shaking. Considering having sponsors place their logo on the back of your Sport Wavers and raise funds. Up to 4 logos can be placed easily.